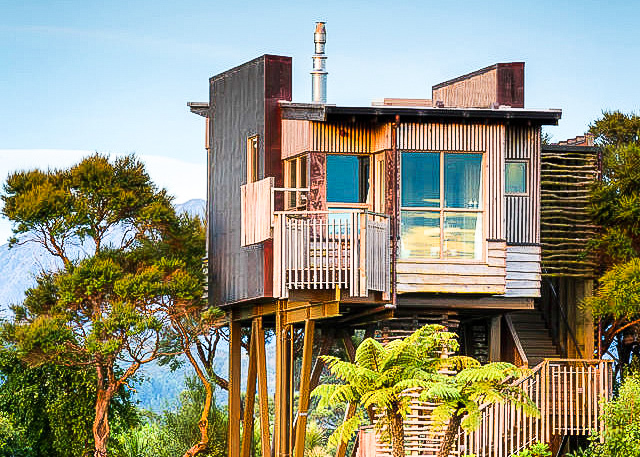 The Coolest Treehouses to Rent on Airbnb. I’ve always wanted a treehouse. Ok, maybe not always - but definitely after watching The Sandlot as a kid. I mean, who didn’t want a place to escape where you could stay up with your friends and learn how to make s’mores? 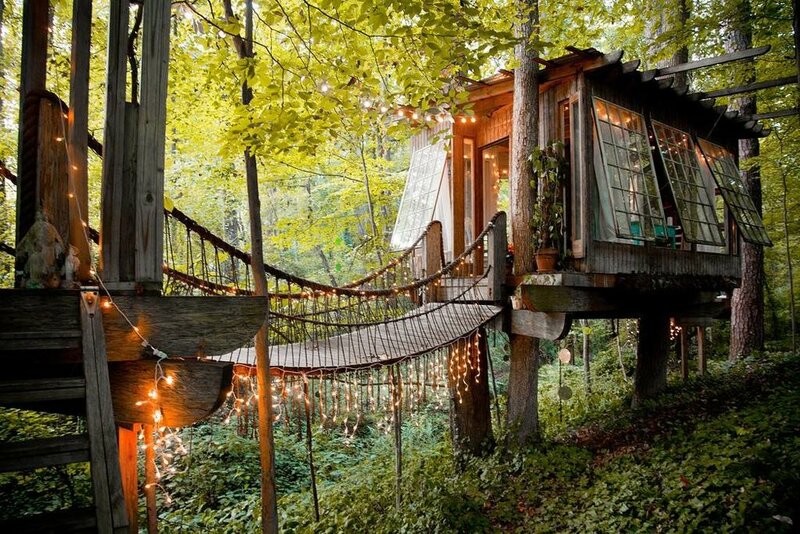 Treehouses are pretty much the epitome of cool. While it’s too late to build one in my backyard (#BrooklynProblems), it’s not too late to stay in one. Why you should stay here: It’s off-the-grid in the Fern Forest on the Big Island of Hawaii with beautiful 360-degree views into the lush surrounding jungles. It’s located at the end of a neighborhood street and there are only five full-time neighbors, so you’ll have tons of privacy (go ahead and channel your inner Tarzan - no one will judge you). You’ll also love the hanging bed, indoor and outdoor showers, and wall-to-wall windows for tons of sunshine that flood the whole home. This treehouse is the perfect place to just escape the world! Why you should stay here: It’s literally Airbnb’s #1 most wished-for listing in the worldwide and for good reason.This intricate treehouse nestled in the Atlanta suburbs is the very definition of magic with twinkling lights, rope bridges, and the opportunity to fall asleep in the trees and wake up to birds singing all around you. If you’re looking to disconnect and get inspired, this secluded treehouse is calling your name. Why you should stay here: First, there’s literally a sign on the front door that reads, “Secret Treehouse. Keep out. No grown-ups.” Remember The Sandlot reference I made earlier? I think this treehouse was made for me. With this listing, you’ll be welcomed by 600 acres of private wilderness in the Blue Mountain Rainforest with views of the deep Bowen's Creek Gorge, can stargaze all night thanks to a telescope in the treehouse, and can relax into the spa surrounded by nature and the forest tree-tops. 4. 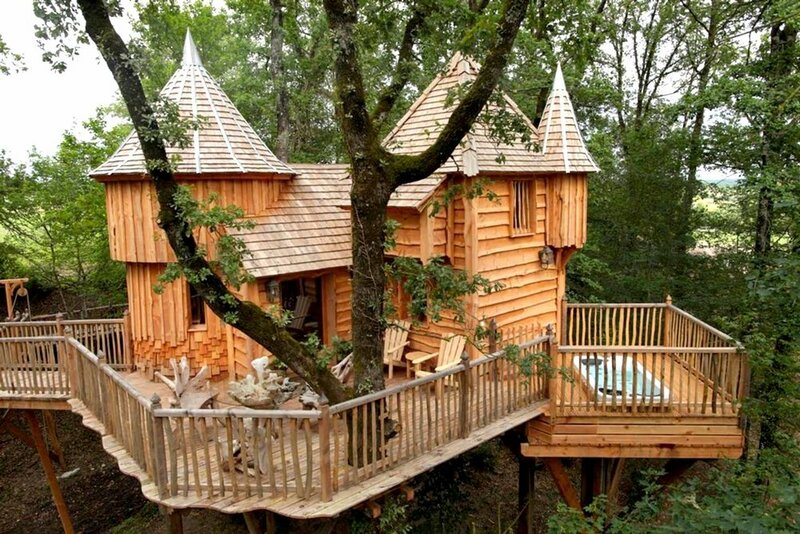 Milandes Spa Castle Treehouse. Why you should stay here: Two words. Infinity pool. Yes, this French treehouse that was inspired by Dordogne castles really has its own infinity pool. That’s not all though. The treehouse is in the very heart of nature nestled into a grove of oaks, and is also a great location for those looking to canoe, by canoe, hike, or ride horses. Why you should stay here: Alright, this treehouse is definitely for the luxury traveler. With its hefty price tag, it certainly has its fair share of awesome amenities though. If you’ve got the cash to burn, this group of treehouses is just about as fancy as it gets. This one sits amongst a 100-year-old Kanuka grove with views of the majestic Kaikoura Mountains from the front and uninterrupted views out to the Pacific Ocean from the back. The Hapuku Lodge Treehouse even has a tub, pool, gym, and indoor fireplace! Which treehouse is your favorite? Any that I missed that are absolute musts? Share below or on social media at @melaniesutra! Where to Stay: 5 Reasons to Stay at the Live! Casino and Hotel.